Michael Jansey Jr. is a current senior at Batavia High School who is involved in football and track. 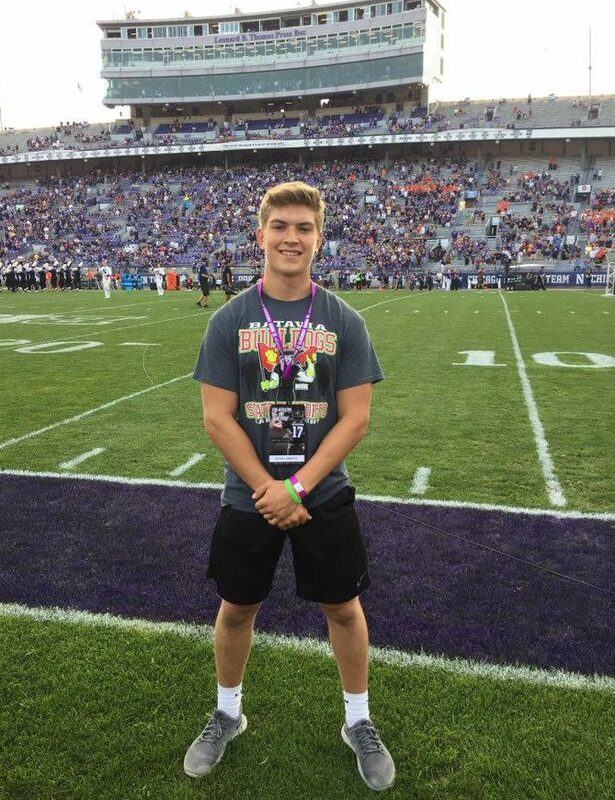 Recently, Jansey has committed to Northwestern University and will be preparing to play on their football team. His goal is to work hard enough in college and build up to pursue a career in the NFL. When he’s not on the field, Jansey is one of the creators of a clothing business called WestExit. Q: What inspired you to do football? A: So basically as a little kid I grew up watching the NFL and watching Batavia High School football like cause I didn’t originally grow up here. I moved up here in 1st grade and I wasn’t even in football at the time I was in basketball, soccer and all of that stuff. So when I came here, my dad put me in the BYF program and that was a lot of fun playing with all of the guys around Batavia and then just watching the Batavia Football team and that was a huge thing that inspired me to do football. Q: Do your parents pressure you to try harder in football and in school academically? A: Not really, my dad has always told me that if it’s not fun for me and I don’t want to do this like we’re so far into doing it, he’s always told me to back out of it if I don’t want to do this. I’m doing it because I love it and that’s what I like to do. Q: You’re committed to Northwestern, what makes them stand out from other colleges? A: What makes Northwestern definitely stand out is the connections I have with the coaches. I have really good relationships with the linebacker coach. Personally, coach Fitzgerald is the best coach in the Big Ten, he loves his players and when you want to choose a school you have to have trust in the coaches because you’re going to be with them every day. That’s a big factor for me and with academics and the new facilities they got, it just takes it to another level. Even if I don’t go to the league someday like the NFL, which is a really small chance, I can go off like that to academics there and I’ll be set for life if I put in the work. Just because you’re going there doesn’t mean you’re going to be set for life but if you use it right then I’ll be good. Q: If you didn’t pick Northwestern, what would’ve been your second choice? A: Probably, I mean a lot of people thought I was going to go to Iowa State but I would say West Virginia. Q: Are you thinking about pursuing football as a career? A: Yes, of course I’m so far into it and I want to go into NFL like it’d be so awesome. 1% of actual college guys make it in so that’s a pretty small number and a really slim chance, but if I work my hardest and get that chance then I’d take it. Q: What were some of your highlights in the season so far? A: I would probably say the St. Charles North game. I was in the last play in that game I got a fake but then I just looked and I saw Art catch it, it’s just insane because I’ve been on Varsity in the past few years and we’ve lost to them in the last two years and going out senior year as the Dukane Conference Champions. They all thought we were going to like lose to all of the new teams so like winning that was another big moment. And honestly just being a senior, like everyday I think about how fast it’s going and this year I came to the mentality that I want to just enjoy it and I don’t really want to think of the negatives and just enjoy it because I know it’s going to be done and with all the guys I’ve grown up with, I’ll never see them anymore. Q: Do you believe your team will make state this year? A: I want to say yes we’re going to make state, but I can’t be too confident about it. We can say state, like we can whisper the word state because we’ve worked our butts off the whole year. I feel like that’s the end goal, we have a really good chance of making it. Q: Do you do any conditioning postseason? A: Oh yeah I do a lot of stuff. I go over to ProForce and workout with Chris over there he’s always really good with me. This past year and like all the years we’ve been getting into the weight room training after school and we go to the fieldhouse and we do a lot of agility work. And then I also do track, which helped me out a lot with my speed. Q: Are you still apart of your WestExit business? Q: Do you think your business will grow eventually? A: Yes, so it’s been kind of slow in the past year because we started off the first year selling a hundred and fifty products and then this year it’s only fifty right now. Over the summer we didn’t do anything crazy about it but now that we’re back in Incubator it got us back on our feet. We just had a new product dropped and it almost completely sold out and I know we’re now coming out with a new product and now we’re giving all of that to our model who models for us. Q: What caused you to create your business? A: It wasn’t really a cause it was something we wanted to do because me and my friends kind of think the same so we’re all best friends. We’ve always wanted to make money someway so this kind of came off the top of the head, it was a long night. It was a cold winter night and we were at a concert so we just missed the train and we had two hours just to sit there and we just thought of the name and how fun it would be just to do it in general so that’s how it all started. Q: Does your business have any competition? A: Yes, we’ve had some competition through the years and kids trying to Twitter beef online and then East Entrance, Twenty Two Mile, and all these big companies in the world that are booming right now. There’s always going to be competition because people don’t always want to see you succeed. Q: Do you have trouble finding free-time between football and your business? A: Yeah there’s a lot of stuff I have to do with time management. Like yesterday was a really long day and so with football right now it’s basically we have film in the morning at like 7, then we have school all day, then we have practice till 5:30 in the afternoon, and then we have film after that and then usually I’ll have PT or something like that. So it’s just a long day and it does take a lot of time management to do it and like once in a while we’ll fit in WestExit but usually, we’re working on WestExit during the school day. That’s why with Incubator right now it’s helped out a lot with our time management with WestExit and personal life because usually with personal life takes up so much part of the day and like having to joint it into part of our day is just hard.